New Way® Air Spindles utilize Porous Media Technology™ to create a uniform cushion of air between the rotor and stator. New Way® Air Spindles deliver a degree of precision not achievable with conventional rolling element bearings. With only one moving part and zero contact, sub-micron synchronous error motion is standard and asynchronous error is almost entirely eliminated. Unlike the complex magnetically suspended or high-pressure oil lubricated systems common to other precision spindle designs, New Way air spindles suspend the rotor on a stiff layer of compressed air, providing frictionless motion without the added complication, and since the components are never in contact, mechanical wear is completely eliminated. This allows for faster rotation speeds and high-precision rotary motion with less interruption or possible down time. The New Way Air Spindles are very low flow and do not consume nearly the amount of air competing orifice air bearing technologies use. If airflow is somehow disrupted, gradual depressurization of the porous media allows for a soft landing that won’t damage the bearing or rotor surfaces, unlike orifice air bearing spindles which often require a complete rebuild after such failures. All air spindles come in a variety of sizes and stator configurations to accommodate an array of rotary applications. In addition to our standard spindle designs, New Way® is happy to work with you on your custom design as well. Contact New Way today to learn what we can do for you! https://www.newwayairbearings.com/catalog/air-spindles/ Air spindles are available in a wide range of standard sizes, in both round and square stator configurations, for your specific application. Don’t see your size here? Contact us to discuss custom options. 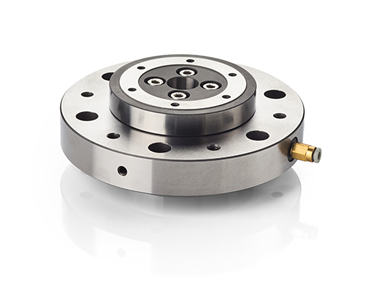 New Way Air Spindle technology can be used in a variety of applications that require rotary motion. They can be combined with other air bearing technology to provide limitless direction of travel. Our air spindles achieve high-precision rotation without contact between components or the need for lubricants meaning less maintenance downtime during your manufacturing process. Don’t see your application listed? Tell us more about your precision rotary needs so we can find the right air bearing solution for you. No contact between rotor and stator so down-time due to mechanical issues in rotary tables is virtually eliminated. With only one rotating element, error motions are significantly reduced allowing nano-levels of precision. Stiff air cushions provide frictionless motion, removing the need for food-grade lubricants in pharmaceutical mixing spindles. Permits high-speed rotation for cutting optical components. Ultra-precision positioning and motion with no wear. Contact us for a complimentary consultation and to learn more about our air spindles!